Petroglyphs are pictograms drawn by ancient cultures on the surface of rocks by incising, picking, carving, and abrading. Drawing is about mark making. Right now, I am looking at a rock that is on my shelf. It has particular marks incised on it. They were most likely created by natural causes-rubbing against another rock. Images, drawings and marks can become a part of a visual language for a designer. Particular types of images and marks become “personal petroglyphs” for me. The composition and spaces between the marks is what I find inspiring. Some of my personal petroglyphs are natural things like rocks, that I have traced or drawn. But others are cultural images found in media. I have a visual language book of images that I collect. Another box contains ephemera-printed material from the past. 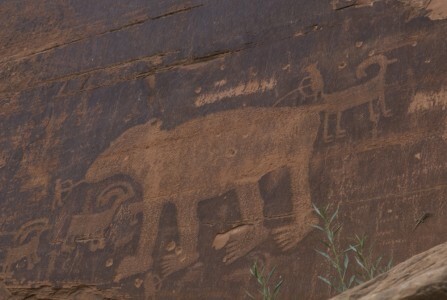 Petroglyphs can become constraints in a design process and relate specifically to a place. I like to hike and look for petroglyphs. This one was found along the highway somewhere near Moab.